The Thistle Rose Community Choir is the largest group within the Thistle Rose Academy of Arts family. With over 35 regular volunteer members, and under the skilled direction of Rachael L. Rose, the Community Choir tackles some of our most ambitious projects as both a large chorus and a theatrical performance group. Following the Thistle Rose Academy of Arts mission, the Community Choir encourages all members of the community to join regardless of past experience and "find their voice". Membership in this group is open, and auditions are not required to participate. Talent levels in the group range from professional vocalists to novices, and from seasoned stage actors to people who have never even been on a stage. The community atmosphere and team focus makes everyone feel like they are welcome and a valuable part of the family. With a balanced approach to education and performance, members are offered the chance to enhance their skills through Master Classes, guest coaching, and working alongside seasoned professionals throughout the year. 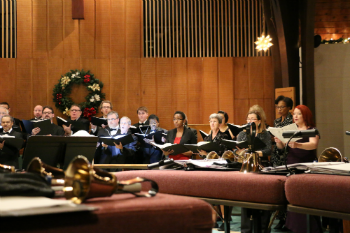 Each season, the group typically conducts 2 performance events; a Spring concert and a Winter Holiday concert. Frequently however, our choir members support our theatrical programs by joining in the ensemble cast. Our members are always growing and looking forward to the next project. Rachael L. Rose, is a Professional Singer, Musical Director, Staff Accompanist at Wayne State University and Director of Music Ministry at Trinity in the Woods Episcopal Church. Ms. Rose has been an active performer and director in the Detroit Metropolitan Area for more than two decades. She was the Musical Director for Wayne State's production of "Legally Blonde: The Musical" alongside Michael Barnes (Director) and Cheryl Turski (Choreographer) in April, 2017 and Assistant Music Director for Opera MODO's production of "Don Giovanni" with Danielle Wright (Director) and Steven McGhee (Music Director) in May/June, 2017. Ms. Rose is Co-Founder and Artistic Director for a local Farmington community organization, the Thistle Rose Academy of Arts, of which the Thistle Rose Community Choir is a part. She has directed more than 9 concerts and productions with the members for the group. A lover of empowering people to realize a love for singing, music and performing, Ms. Rose invites people from all walks of life, backgrounds and skill levels to join the group and experience creating art together. She loves to see people grow as musicians but more importantly as people through the power of music in community.